The sun MAY shine but you could always pull those curtains. 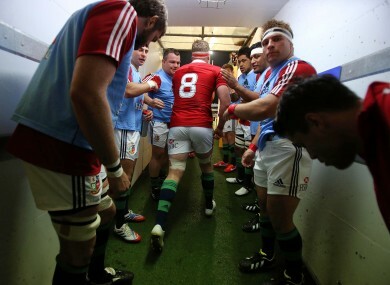 Jamie Heaslip takes the field for the Lions. One to watch: Offaly v Kilkenny? Game on, Ger. One to record: We’re gonna be all over that Lions game. After a bit of a lie in. One to skip: I won’t watch darts in June. Boxing: European Boxing Championships, (RTÉ Two, 6.30pm); John Molina v Andrey Klimov (ESPN, 3am). Cricket: Champions Trophy, West Indies v Pakistan (Sky Sports 1, 10am). Darts: UK Open (Sky Sports 4, 7pm). Football: World Cup qualifiers: Group C, Ireland v Faroe Islands, (RTÉ Two, 7.15pm, Sky Sports 1, 7.30pm); Group A, Croatia v Scotland (ESPN, 7pm); International friendly, Indonesia v Holland (ESPN, 2.30pm). General: Seo Spoirt, (TG4, 8.30pm). Golf: European Tour, Lyoness Open (Sky Sports 2, 10am and 3pm); PGA Tour, St Jude Classic (Sky Sports 3, 8pm). Motor racing: F1 Canadian Grand Prix practice (Sky Sports 1, 2.45pm and 6.45pm, BBC2, 3.45pm and 7pm). Rugby: Tour match, Japan v Wales (BBC1 Wales, 5.45am); Super Rugby, Brumbies v Rebels (Sky Sports 3, 10.30am). Tennis: French Open (Eurosport and ITV4, 11.30am, Setanta Sports Ireland, 12pm). Cricket: Champions Trophy, England v Australia (Sky Sports 1, 10am). Darts: UK Open (Sky Sports 4, 1pm, Sky Sports 1, 7pm). Equestrian: Global Champions Tour, Stratford (BBC1, 3pm). Football: U21 European Championship, England v Norway (Sky Sports 2, 4.30pm); Italy v Israel (Sky Sports 2, 7.15pm). GAA: Leinster SHC quarter-final: Wexford v Dublin, (RTÉ Two, 6.40pm). Golf: European Tour, Lyoness Open (Sky Sports 3, 12pm). PGA Tour, St Jude Classic (Sky Sports 3, 6pm). Horse racing: Channel 4 Racing (Channel 4, 1.35pm). Motor racing: F1 Canadian Grand Prix practice (Sky Sports F1, 2.45pm, BBC2, 2.45pm); Qualifying (BBC 1 and Sky Sports F1, 5pm, Setanta Sports Ireland, 5.55pm). Rugby: Tour match, Queensland Reds v British & Irish Lions (Sky Sports 2, 10.30am). Internationals, Argentina v England (BBC 2, 7.30pm); New Zealand v France (Sky Sports 2, 8am); Scotland v Samoa (Sky Sports 2, 1.30pm); South Africa v Italy (Sky Sports 3, 3.55pm). Tennis: French Open (Eurosport and ITV1 1.30pm, ITV4, 12.30pm, Setanta Sports Ireland 2pm). Basketball: NBA finals (ESPN, 1am, Sky Sports 1, 1.30am). Cricket: Champions Trophy, Sri Lanka v New Zealand (Sky Sports 1, 10am). Darts: UK Open (Sky Sports 2, 1pm, Sky Sports 1, 7pm). Football: U21 European Championship, Holland v Russia (Sky Sports 2, 4.55pm); Germany v Spain (Sky Sports 2, 7.15pm). GAA: Leinster SHC, Offaly v Kilkenny, (RTÉ Two, 1.30pm); Munster SHC, Limerick v Tipperary (TV3, 3.30pm); The Sunday Game, (RTÉ Two, 9.30pm). Motor racing: F1 Canadian Grand Prix (Sky Sports F1, 5.30pm, BBC1, 6.15pm, Setanta Sports Ireland, 6.55pm); World Touring Car Championship, Moscow (Eurosport, 7am, 10am & 11am); British Touring Car Championship, Oulton Park (ITV4, 11.30am). Rugby: Super Rugby, Western Force v Waratahs (Sky Sports 3, 7am); Junior World Championship: South Africa v England (Sky Sports 4, 3.30pm); Ireland v Fiji (Sky Sports 4, 5.30pm); New Zealand v Australia (Sky Sports 4, 7.30pm). Tennis: French Open (Eurosport and ITV1 1.30pm, ITV4, 12.30pm, Setanta Sports, 11am). Email “Don't touch that dial... here's the sport on TV this weekend ”. Feedback on “Don't touch that dial... here's the sport on TV this weekend ”.